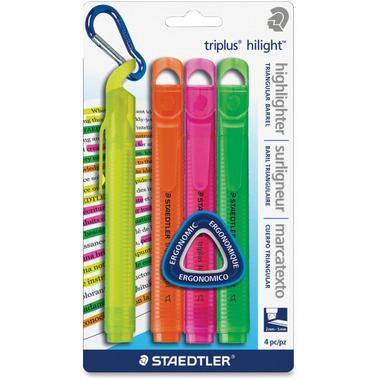 Staedtler Triplus Broad Tip Fluoresct Highlighter feature a comfortable triangular barrel for fatigue-free use and a convenient hanging loop on the cap. Locking tips deliver bright, fluorescent colour ink that is low-odor, fade-resistant, quick-drying and smearproof. The cap also includes a built-in pocket clip to hang on notebooks and pockets. Use on office paper, copies and faxes. Excellent Markers; s0 well DesigneD PriceD! !